My World---Ryan: How dumb can you be?? How dumb can you be?? Kevin found this on one of his Disney boards. A lady called in an order for a cake over the phone to Wal-mart. She asked then to write Best Wishes Suzanne and underneath that We Will Miss you. This is the cake she got. They said it was too funny not to keep. 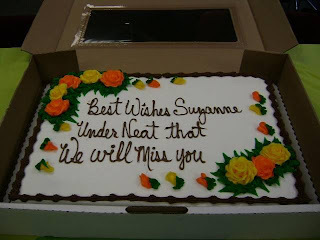 Seriously how dumb do you have to be to write that on a cake! That is so funny. I can`t stop laughing. Oh I believe it. When I called Kroger for Olivia's baptism cake I had the hardest time telling the lady what I wanted on it. She asked me how to spell baptize about 6 times and I wanted it to say "Olivia Grace baptized June 10, 2007" and it said "Olivia Baptize June 10, 2007" so she left off the "ed" and it looked like it was a to do list. Plus she left off her middle name. Then when I picked up the cake our last name was spelled "Surdan" when its Burgan! However...this one takes the cake! HA! Oh I laughed out loud at this!!! HOW FUNNY!!! Do you guys watch movies in theater or on internet? I use to rent DVD movies from [b]Bigflix.com[/b]. Recently I discovered that we can watch all new movies on internet on day, they are released. So why should I spend money on renting movies??? So, can you guys please tell me where I can [url=http://www.watchhotmoviesfree.com]watch latest movie The Switch 2010[/url] for free?? I have searched [url=http://www.watchhotmoviesfree.com]Youtube.com[/url], [url=http://www.watchhotmoviesfree.com]Dailymotion.com[/url], [url=http://www.watchhotmoviesfree.com]Megavideo.com[/url] but, Could not find a good working link. If you know any working link please share it with me.